What is Your Biggest, Most Audacious Goal in Life? My biggest, most audacious goal in life is to own an NFL team! My team is called the Hawaii Tiger Sharks (www.HawaiiTigerSharks.com), and we will open operations in Honolulu within ten years when we raise $2 billion in revenue. In addition to the required investment capital, we will need to receive the blessing from the NFL to purchase an expansion team. Keep in mind that in the eyes of the NFL, cities higher than Honolulu on their priority list include Los Angeles, London, Toronto and perhaps even San Antonio. Therefore, how am I going to pull this off, you might ask? I have no idea, but I am pursuing a strategy that I believe will work. In the late 1920s, Henry Ford pre-sold an estimated 375,000 automobiles at $600 each, and raised $225 million in revenues. With this money, he was able to build the first assembly lines to manufacture his pre-sold automobiles. The rest is history and today, Ford Motor Company is one of the world's largest automobile manufacturers. Why is this important you may ask? I intend to do something very similar in nature. My goal is to raise $2B in ten years. I am going to do this by selling our Hawaii Tiger Shark hats for $100 each. For each hat purchased, you will receive a Hawaii Tiger Sharks ticket to a future game ($100 x 20 million hats = $2 billion in seed money). If for whatever reason, I am unsuccessful in my bid to get an NFL team, you will have purchased a $100 hat, and agree not to take any recourse against me, or our ownership group. In the meantime, your $100 Tiger Sharks hat will serve as your daily reminder to pursue your biggest, most audacious goals in life � no matter how bold or fearless they may be! 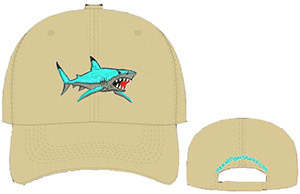 To purchase your $100 hat, and free ticket to a future Tiger Sharks game (within 10-15 years as only a certain number of free tickets can be allocated per each game), click on the image or link below to place your order. There is no limit to the number of hats you may purchase. Thanks for your support and purchase of your Hawaii Tiger Sharks $100 hat. I challenge you to let your hat serve as your daily reminder to pursue your biggest, most audacious goal in life! P.S�If you would like to pay more than $100 for your Tiger Sharks hat, all additional seed money donated is greatly appreciated! P.S.S�Now you know my biggest, most audacious goal in life; what is yours? If I can help you in any way achieve your biggest goal please let me know. Click here to buy your hat today. Dream, Plan, Execute and Soar!